The Wisconsin County Mutual Insurance Corporation (County Mutual) is dedicated to serving Wisconsin’s counties and local governments and the people they serve by providing long-term stability in insurance coverages, while proactively working to control costs. The County Mutual is A.M. Best rated and is owned by member counties and has the financial security and comprehensive programs and services that will protect your county, while saving precious taxpayer dollars. What makes the County Mutual unique is our close working relationship with member counties. Acting in collaboration, the County Mutual and county owners work as a team to aggressively control their claims costs by promoting quality risk management efforts that are second-to-none in the industry. What started as a handful of counties joining forces in the midst of an insurance crisis in 1988 has grown to close to 75 percent of Wisconsin’s counties being insured by the County Mutual today. The Wisconsin County Mutual Insurance Corporation. Working together, we truly are a mutual effort. The Wisconsin Counties Association serves as the corporate management for the County Mutual. As corporate management, WCA negotiates and manages the contracts between the County Mutual and its service providers; manages the County Mutual's finances and investments; serves as liaison with the Office of the Commissioner of Insurance; manages and facilitates the Board's operations; and provides state and federal legislative consultation, lobbying and public relations. 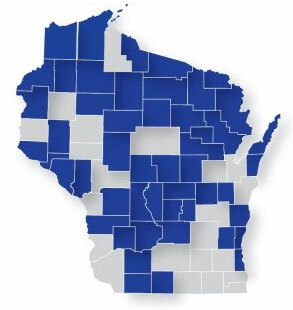 For more information on the Wisconsin Counties Association, visit www.wicounties.org or 1.866.404.2700. Aegis Corporation serves as the County Mutual's general administrator. Aegis provides services in four areas: general administration, claims and litigation management; loss prevention; and marketing. For more information on Aegis Corporation, visit www.aegis-corporation.com or 1.800.236.6885.